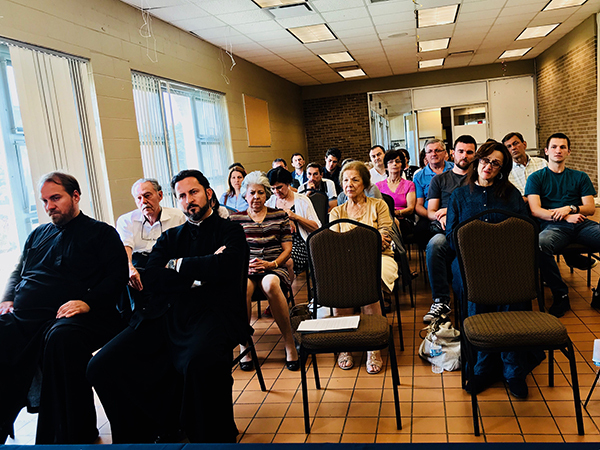 On the Tenth Sunday after Pentecost, Orthodox Serbs of Chicago and the surrounding area had the opportunity to commune both spiritually and prayerfully with Fr. Andrej, a hieromonk of Visoki Decani Monastery in Kosovo and Metohija and professor at Sts. Cyril and Methodius Seminary school in Prizren. Fr. Andrej has been in the United States of America for several days, and the main reason for his visit is two-fold. 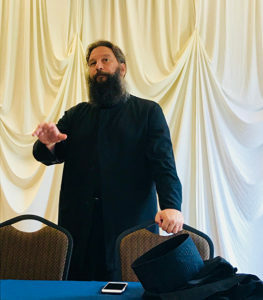 He participated in the 100th Anniversary of the completion of the World War I, which was organized by the Eastern American Diocese of the Serbian Orthodox Church, and at a Conference for Religious Freedom, which was organized by the American government. Both of these meaningful events took place in the US Capitol, Washington, D.C.Aside from that, Fr. Andrej visited our monasteries and churches, as well as many significant landmarks in America. On the feast of Martyrs Trophimus and Theophilus, Sunday, August 5, 2018, Fr. Andrej celebrated Divine Liturgy at the Holy Resurrection Cathedral in Chicago. Concelebrating with him were Archpriest Darko Spasojevic, Cathedral Dean, and Archpriest Dobrivoje Milunovic, Parish Priest. Following the Prayer behind the Ambo, a memorial service was served for all the Serbian men, women and children of Krajina who lost their lives during the criminal undertaking of ethnic cleansing that took place under the name “Operation Storm”, which took place 23 years ago. Along with the serving priests, Fr. Nikolaj Kostur, who served the first Liturgy, participated in the memorial service. Fr. Andrej delivered a sermon to the faithful people on the topic of the Sunday Gospel about the healing of the ill child who was tormented by an evil spirit. Fr. Andrej spoke about the importance of faith and love in the life of an Orthodox Christian, manifested in good works. The greatest work a man can do is to raise his children in the spirt of the living Word of God, as did St. Stefan of Decani, the King of Serbia. Fr. 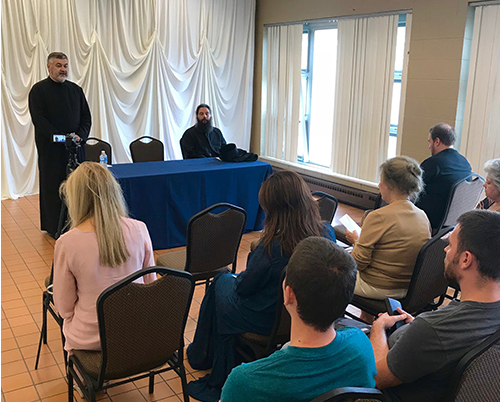 Andrej specifically spoke about the importance of active participation in the Liturgical life of the Church and invited the faithful to regularly participate in the Holy Sacrament of Communion. Following the Divine Liturgy and the Agape meal, Fr. 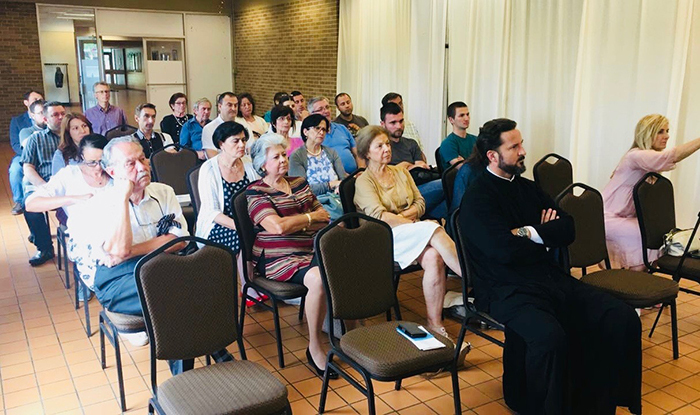 Andrej held a concise and meaningful lecture on the life of the Serbian Orthodox Church and our people in Kosovo and Metohija. The lecture consisted of three themes. In the first part, he spoke about the historical, spiritual, cultural and existential importance of Kosovo and Metohija and the Serbian people in general. He especially emphasizedthat we need to refer to the territory as Kosovo and Metohija, and not only Kosovo, explaining that the specific meaning of the word Metohija is metochion, or land that is under the control of a monastery, i.e. the Church. Thus, in the very etymology of the name Metohija, we find the answer to whom the mentioned area belongs.In the second part of the lecture, Fr. Andrej spoke about the difficult condition in which our holy shrines, monasteries and churches in Kosovo and Metohija are in, as well as the Serbian people which has remained. Aside from poverty and scarcity, the greatest problem of our people is fear of Albanian terror, which they are exposed to daily. Various factors, external and internal, contribute to this state. He warned that the division or exchange of territories would be devastating for the Serbs in Kosovo and Metohija. Specifically, two-thirds of the Serbian population live south of Ibar River, and are mostly concentrated in Kosovo Pomoravlje, around Gracanica and Strpce, as well as in Metohija, while only one-third is in northern Kosovo. In the third part of the lecture, Fr. Andrej acquainted those present with the work of Sts. Cyril and Methodius Seminary school in Prizren, whose work restarted a few years ago and has already graduated three classes of seminarians. This theological institution was founded in 1871, and in 1999, due to Albanian terror, was forced to move to Nis. By the great efforts and work of Bishop Teodosije of Ras-Prizren, the Seminary was opened once again in 2011. The greatest number of seminarians are from the territory of Kosovo and Metohija, but there are also students from different areas of Serbia. The significance of the Seminary is of invaluable importance for the survival and life of our people on the most sacred Serbian territory. Fr. Andrej appealed to all our people to continue helping our Serbs in Kosovo and Metohija. He especially praised the work of the humanitarian organization “Our Serbs” and thanked Kathy Fanslow, the president of this organization. In addition to material assistance, Fr. Andrej extended an invitation to our faithful people to visit Kosovo and Metohija, because that, along with prayer, is the greatest support that we can offer to our brothers and sisters who live in very difficult and unsafe conditions. Following the lecture, Fr. Andrej answered some very interesting questions and thus made this blessed gathering even more interesting and meaningful.